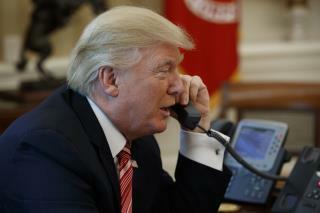 (Newser) – President Trump says the leak of his daily schedules "should have been reported as a positive, not negative"—because it shows just how hard he is working. The leak showed that around 60% of Trump's workday is unstructured "executive time," but the president says that time involves hard work, USA Today reports. "When the term Executive Time is used, I am generally working, not relaxing," Trump tweeted Sunday. "In fact, I probably work more hours than almost any past President." He added: "The fact is, when I took over as President, our Country was a mess. Depleted Military, Endless Wars, a potential War with North Korea, V.A., High Taxes & too many Regulations, Border, Immigration & HealthCare problems, & much more. I had no choice but to work very long hours!" What the leak showed is that he is sleeping through his presidency and is a lazy F... being glued to foxnews is not work. I believe that Trump does work more than previous presidents. and that is why he has already accomplished more than previous presidents, and in the same amount of time.